Introduction: Nigerian medicinal plants have been demonstrated to be veritable source of lead compounds for drug discovery efforts. One such example is mangiferin. Mangiferin was originally isolated from the Nigerian plant Ceiba pentandra (Mombacaceae), after which its structure was elucidated with the aid of spectroscopy. Mangiferin, a xanthone glycoside, has also been reported in certain other plant families including Gentianaceae and Anacardiaceae. In certain other climes and different parts of the world, folkloric and traditional medicine has extensively employed Mangifera indica (another source of mangiferin) in treating different diseases. For many of such cultural uses carefully designed experimental investigations have been conducted confirming mangiferin’s efficacies in those different pathologies which have included but not limited to cytotoxic as well as chemopreventive properties in selected cancer cell lines. Methods: In this study, computational techniques were employed to profile the interaction of the xanthone glycoside at the atomistic level against nine selected molecular targets with clinical relevance in tumorigenesis. In attempt to investigate the potential of the mangiferin structure as a viable starting point for synthetic exploration of mangiferin-based analogs, extensive structural modifications were performed. Results and Conclusion: By analyzing the resulting structure-energetic pattern, critical points capable of improving mangiferin interaction with the profiled targets were identified. 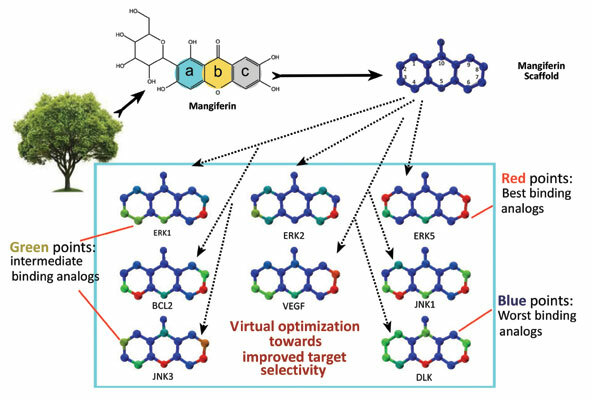 The outcome of this study provides both direction and impetus for synthetic derivitization of the mangiferin molecule into novel optimized inhibitors for anticancer lead development. Keywords: Ceiba pentandra, mangiferin, virtual screening, cancer, docking, structural optimization. Keywords:Ceiba pentandra, mangiferin, virtual screening, cancer, docking, structural optimization. Abstract:Introduction: Nigerian medicinal plants have been demonstrated to be veritable source of lead compounds for drug discovery efforts. One such example is mangiferin. Mangiferin was originally isolated from the Nigerian plant Ceiba pentandra (Mombacaceae), after which its structure was elucidated with the aid of spectroscopy. Mangiferin, a xanthone glycoside, has also been reported in certain other plant families including Gentianaceae and Anacardiaceae. In certain other climes and different parts of the world, folkloric and traditional medicine has extensively employed Mangifera indica (another source of mangiferin) in treating different diseases. For many of such cultural uses carefully designed experimental investigations have been conducted confirming mangiferin’s efficacies in those different pathologies which have included but not limited to cytotoxic as well as chemopreventive properties in selected cancer cell lines.